I don't think any of mine are that high. I was having issues with the extruder getting really hot, even with the driver turned down as far as I could. The voltage on that was less than 0.30v. I just received a larger stepper motor to see if I can lower the heat and keep everything running smoothly. Most of the voltage recommended in the config guide are below .40v. If you have to crank the voltage to get everything moving smoothly, you may have over-tightened the belts and/or have binding elsewhere. The Y-axis skipping after printing for a bit is the thermal protection built into the stepper driver. All of my motors, extruder excluded, run nice and cool. Even after hours of printing. As I mentioned before, my Y motors may be more powerful than the spec says, and if you have the same one (5.3 rather than 4.8 kg/cm) it might need a little more than this. I'm having some issues where I find the extruder will start clicking... I think this is because my hotend is becoming clogged somehow causing it to need a large amount of pressure to extrude. Any ideas?. I've been printing for about a week now (almost went through a 1kg of abs) couple days ago the x axis started shifting during printing. After examining the x carriage a little I noticed that the belt clamp/holder thing started to wrap... Are the printed parts made out of abs or pla? 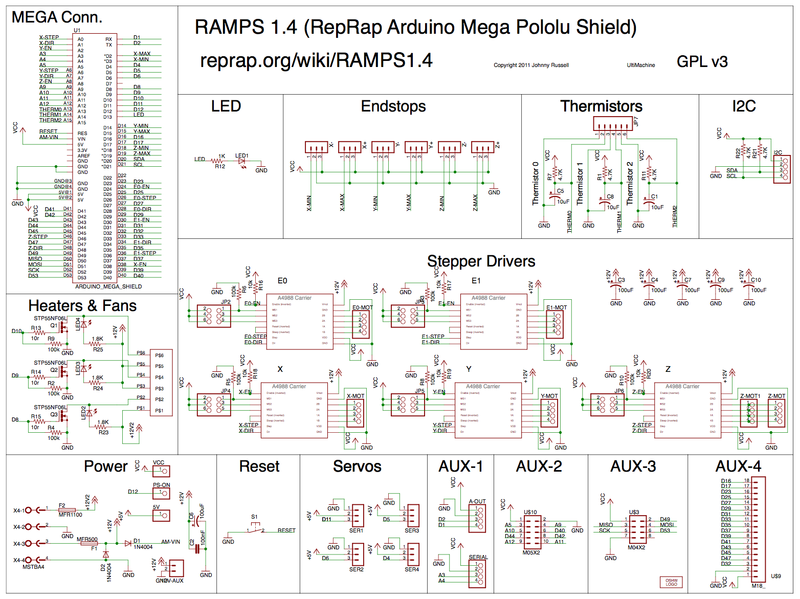 A follow up to an earlier post: if you want to see what I mean by the RAMPS board being horrible, look at this picture: [2.bp.blogspot.com]. The replacement I bought is much nicer (and has color coded pins for the limit switches, to reducing the chance of plugging them in the wrong way). We've switched vendors and our new ones are also color coded. We are pretty happy with them, I don't know what happened with our previous vendor but the soldering was starting to get pretty sloppy towards the end it seems. Hmm. Should I pull mine apart and check it? MIne looked pretty bad aswell. 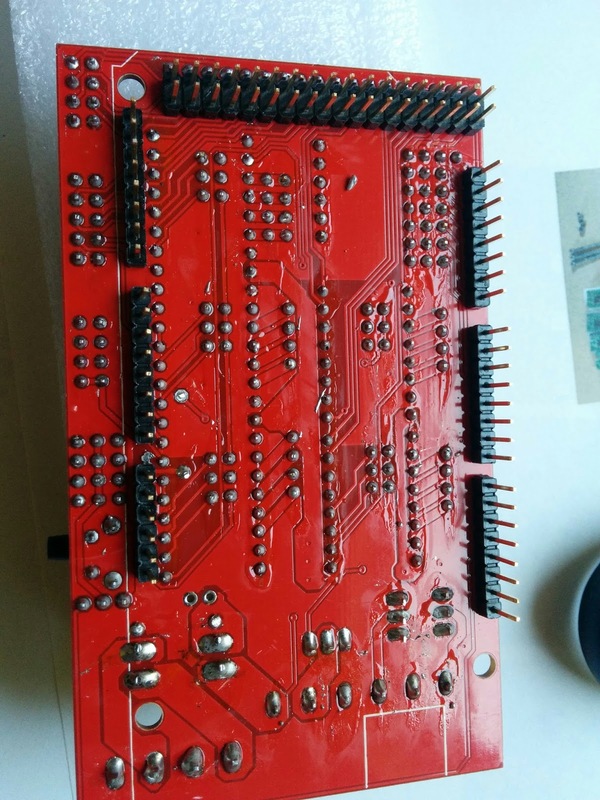 It seems whoever made it made no effort to clean up random lines of solder on the pcb. That gets the travel working, although I am still seeing the bounce on homing. Is there an estimate for when the 200x200x300 mm will be available? You got a spare limit switch with the kit, right? Might be worth swapping it out. Sounds like strange behavior to me. Or hit home then click the switch with your finger to see if you get the same "bounce" ? Did you print a mount for it? I saw a couple that might work well that I'm going to print tonight. Replacing the limit switch has no effect. Manually triggering the switch halfway through the home travel creates the bounce mid-run. If I hold it, it stops at the apex of the bounce. If I press and release quickly, it travels towards the limit switch for about 10 units at a much slower speed. While I'm here, I should ask what you recommend for the printing surface. Should I get a piece of glass cut, or would a thinner wall tile work fine? Mine's at 5 / 5 / 3. I don't see a place where that constant is used anywhere else in the code. Yeah, I know (which is why I said mine was essentially that). When I ported my configuration file to the newer version of marlin I had to uncomment the right ones is all. What's the correct set to have active? I was looking to see if you could upload a copy of the Marlin code to save me the time of merging the settings from dropbox with the newest code of Marlin. Howdy folks, just put in my order for the 2020 i3 today and eager for it's arrival. Going to be looking through this thread top to bottom until it arrives. Currently I'm waiting on some bolts to get my Makibox A6HT back in action; I got it tuned to as good as I think it can run and am hoping the i3 will give better stability and results which shouldn't be too big a stretch given the Makibox design limitations. The well known and documented extruder failure/wheel spoke snapping is the holdup..or actually trying to find M3 bolts in small town Alberta for the FroZEN upgrade is the real culprit. Is the double bounce bad? I assumed that's how it was supposed to work! Besides, you shouldn't hit that when you're printing, only homing. My X motor is running hot though. While printing the 2nd fan bracket, I checked it and I could keep my finger on it for about 2 or 3 seconds. I may try lowering the voltage more to see of that helps, but I'm skeptical. I'm also tempted to put a heat sink and fan on the back... I have one off of an old motherboard chipset that fits perfectly. I'm wonder if all I need is a bigger motor! The ones that are left uncommented above are the ones that are working for me. I can, but I suspect the configuration of mine is not going to be the same as yours. I've zipped up the folder - now I need to find a place to make it accessible. Maybe I am reading this wrong but according to the tuning guide - the A4988's should be set to .280v? I have mine all set to .280v and all seem fine - except the stepper motor on the X axis gets very hot. The drivers, however, stay cool. Thoughts??? Edited 1 time(s). Last edit at 06/12/2015 11:44AM by plrmaker7. I looked at the tuning guide, and the motor specs again (assuming the motors FogerTechs sells are the ones in the kit)... The X, Z, and E motors are rated at .4A, and the Y motor at 1.5A. Following the calulation in the guide, vRef for X,Z, and E should be around 0.160V (0.4*8*0.05). And Y should be 0.600V (1.5*8*0.05). But, the Z is running 2 motors, so you'd have to double the voltage to 0.320V, and effectively the current to drive both motors. I think I'm going to try that tonight and see if it helps the X motor heating issue any. Can you post a pointer to this tuning guide? I suspect you're mistaken in terms of doubling the voltage because you have two motors (though I may also be wrong). You want the same voltage to each motor and I have to believe they are wired in parallel, not series. True the current would be twice a single motor, but that would be at original 0.160v. I think doubling the voltage is only going to make things hotter. I also suspect that the 1.5A motor should be for the Extruder and not the Y Axis. Can't comment on the way the Z motors are wired as I dont have one of these. Edited 1 time(s). Last edit at 06/12/2015 03:49PM by markts. With Pololus, the sensing resistors are Rs=0.05 ohm, so a Vref of 0.4 should produce a maximum current of 0.4/(8*0.05)=1A. Clockwise increases the current which will make the motor run hotter and counterclockwise reduces it which will cool it down (seeforum thread 159081). With a measured Vref of 0.273V, I should expect 0.6825A, and I measured the current through one coil as 0.486A in fullstep mode,which should be 0.7071 of the full trip current, or I_TripMax= 0.486/0.7071= 0.687A, which seems close enough. The Vrefsignal is accessible as the "VREF" pin on the carriers with voltage regulators, as the through-hole via on the carriers without, and also as the wiper on the trim pot itself on both carriers. Note:for StepStick, the Rs=0.2 ohm, so you'd get 4 times the Vref at the same current.